Fishing starts getting serious once you buy a proper fish finder and having one can make the game that much easier for you. A proper fish finder has all the features that you will need for an efficient fishing experience, but finding a great one is always a little tough to do. If you are a beginner, these features might not yet make sense, but they will definitely be handy when the time comes. The Lowrance HOOK2-5 Fish Finder is one of the top fish finders with an advanced CHIRP sonar and Downscan imaging. It puts all the versatility in your hands to do whatever you like and with a highly accurate GPS, tracking your way is made easy. While still one of the high-end fish finders, it does not have such an expensive price, which makes it ideal for anglers looking to get serious about fishing. The Lowrance HOOK-5 Fish Finder features a CHIRP sonar and DownScan imaging, both working at different frequencies. Lowrance boasts this as some of the latest technology used in fish finders and it can be switched between to meet the needs of the user. The DownScan Imaging runs on 455/800 kHz, while the CHIRP sonar runs on a frequency of 83/200 kHz. Having the CHIRP sonar is a massive improvement in technology and although it was only found on rigs and expensive fishfinders a couple of years ago, it is now incorporated into modern fish finders as well. The CHIRP sonar sends out frequencies in a pulsing manner and this makes it much easier for the transducer to effectively show a clear picture of what is going on underneath. When comparing the display of the HOOK-4 and the HOOK-5, the display is a little larger. The Lowrance HOOK-5 Fish Finder features a 5-inch display and also has the multi-window function. The page selector can be operated with one thumb thanks to the design and all features are readily available to be used with the page selector. The Lowrance HOOK-5 Fish Finder features a GPS system features a highly sensitive antenna and provides you with over 3000 maps of US lakes and coastal areas up to 1000 feet. Additional chart upgrades and maps can be purchased separately for the user to expand their library and get more versatility when it comes to lakes and rivers. As one of the main features in the HOOK series, the Lowrance HOOK-5 Fish Finder also features advanced signal processing, reducing the need for the user to constantly adjust the settings. The settings are automatically adjusted as the fish finder sends out signals to get the best picture and provide clear pictures of the bottom that might even be harmful to your boat in darker waters. The Lowrance HOOK-5 does have 2 additional variations and these are designed for specific types of fishing. The Ice Machine is designed for the avid ice angler and this will help detect any fish found in these horrid conditions. The Ice pack can be removed and added as you please, but having it will add more versatility and functionality to the fish finder. The HOOK 5x is designed for kayaking and fishing on local lakes that you love and know. This fish finder is a little cheaper and does not include the GPS features. However, it does have all the other features of the HOOK-5 and will be ideal for beginners. While the Lowrance HOOK-5 Fish Finder is easy to use once it has been mounted and installed, this can be quite a tricky situation. Mounting it and figuring out the instructions does prove to be quite a challenge, but once this has been surpassed, it will be easy to use. Since it can be operated with one finger, your hands can be on the steering wheel or you could even multitask while using it. Checking multiple stats and charts is quite easy and the screen can simply be converted to the multi-window mode. This opens up three additional windows, giving you more versatility and making it easier to see if you are moving over a potential big catch. Lowrance does not skimp when it comes to versatility and this fish finder can be mounted and dismounted quickly once the quick release bracket has been installed. This makes it possible to switch it between your kayak, or any other vessel, or simply just removing it for security reasons when the device is not being used. The device is quite durable and portable as well. It is made small to make it easy to store and it features a waterproof rating of IPX7, making it water resistant in 1 meter of water for up to 30 minutes. The larger screen size also makes it much easier to see any potential fish and the backlight is ideal for bad weather situations. However, if you love ice fishing the Lowrance HOOK-5 Ice Machine is an additional pack of features that will help you in the ice and the ice transducer has been specifically designed to pick up fish and objects in near-freezing temperatures. The features do work fine once you have figured them out and the multiple sonar frequencies offer you some multifunctional use. Tracking fish is made easy and the one-hand operations allow the user to program the GPS and the fish finder for additional depth and fish alarms whilst continuing to steer the boat of prepare for casting. The one downside we did find is that the backlight on the LCD screen is not as effective as some of the previous models. It tends to be a little dim and this could make it a little harder to spot fish on very sunny days. However, the ice fishing pack is ideal for bad weather situations and the fish finder tends to work perfectly when fishing in cold temperatures. 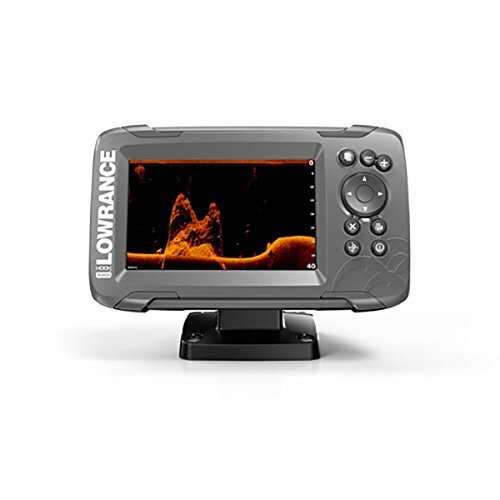 The Lowrance HOOK-5 Fish Finder is a perfectly affordable fish finder that brings a larger screen and the same high-end features as the HOOK-4. While some of the feature do work a little smoother, it still remains larger version of the HOOK-4. 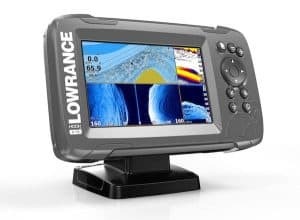 It is not the best Lowrance fish finder but should be the ideal fish finder for the intermediate angler. See our Lowrance HOOK-4 review. As a larger version of the HOOK-4, the Lowrance HOOK-5 has many of the same rivals as the aforementioned and these tend out to be much cheaper than the HOOK-5. This model is designed for bringing versatility to your fishing experience, but so is the Raymarine Dragonfly 4PRO Sonar/GPS with US C-Map Essentials, it is around the same price, but has a smaller screen. The Raymarine Dragonfly 4PRO Sonar/GPS features a decent 4.3-inch screen and a state of the art GPS system. The screen is fully waterproof and a functional backlight makes it easy to put is on and off in times of bad weather. The one benefit of this fish finder is the Wi-Fish app, allowing users to set waypoints with one another and share hotspots. The sonar can also be streamed from your mobile device. See our Raymarine Dragonfy 4PRO review. The Humminbird HELIX 5 CHIRP GPS G2 is around the same price and also includes the CHIRP Sonar technology. It comes with micro USB port for downloading additional maps without having to pay extra and the screen is also 5-inches. The horizontal design looks more stylish and should be a little easier to read in all weather conditions. Fishing Tech will happily give the Lowrance HOOK-5 and all of its variations an overall rating of B+ and while it is just a larger version of the HOOK-4, it will look much better and make it easier to spot fish for intermediate anglers.